2018 AGM report: all change! First up was the business section of the meeting. 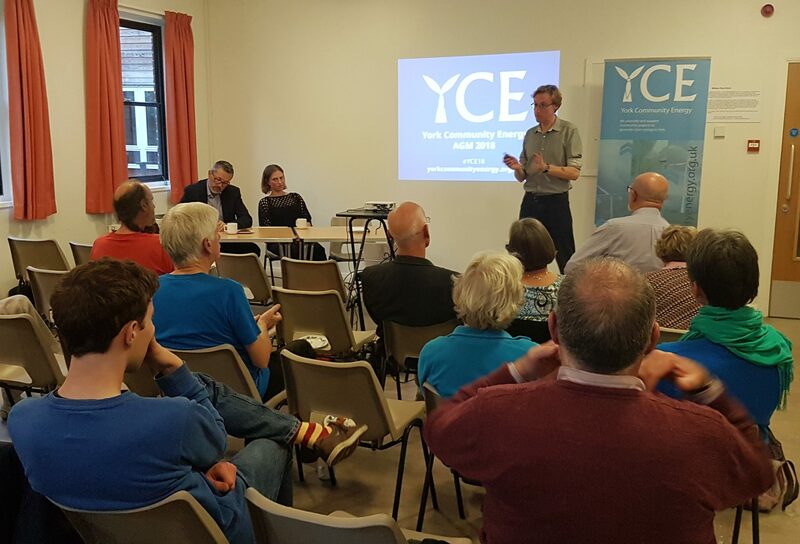 We like to keep this bit brief for obvious reasons, but there was one item worth noting in particular: Richard Lane has stepped down as Chair of YCE in order to spend a year at the University of Strathclyde in Glasgow, studying for an MSc in Renewable Energy. Richard has poured his heart and soul into YCE over the last few years, and we are eternally grateful to him for everything he has done. I’m sure we haven’t heard the last of him though! Taking over as Chair is another long-serving YCE Member, Ivana Jakubkova, who received unanimous approval from the Members present at the meeting. No doubt she will do a great job, and we are looking forward to the next 12 months under her guidance and leadership. The only other personnel change was the election of Tom de Simone (who became an Ordinary Member last year) to Social Media Officer – a previously unfilled position. The past 12 months also saw a visit by several YCE members to some of York’s Passive Houses as part of a nationwide programme to promote awareness of these wonderful sustainable dwellings. 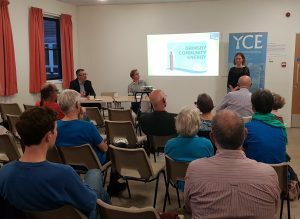 Later in the year we hosted our very successful Energy Café event, and also took part in a special Speak Up Week surgery with York Central MP Rachael Maskell, who was happy to sign a cross-party letter to Theresa May pressing for higher environmental standards. The bad news was that the Eco Business Centre solar project announced at last year’s AGM has sadly hit a few stumbling blocks, but we are working with City of York Council to see if we can overcome these, or even find another council building to host an array of solar panels. We then heard from our first guest speaker of the evening, Dr Vicky Dunn from Grimsby Community Energy, who gave an inspiring talk on their successful projects, and offered some sage advice for how to fund and run a community energy project. For example: don’t be afraid to advertise yourself wherever possible, and know when to call in the experts; don’t try and do everything yourselves if you don’t have the time and the qualifications. It sounds like Vicky and her colleagues have done a great job, and we wish them continuing success for the future. Next up was Jim Cardwell from Northern Powergrid, who supply the electrical grid infrastructure for Yorkshire and the North East. Jim spoke of how the energy landscape is changing from a supplier-customer relationship to a more two-way relationship, where businesses and residents contribute not only energy to the grid, but also data on how and when energy is being used. Far from standing still, Northern Powergrid are innovating and experimenting in several areas, including: support for local peer-to-peer energy trading; on-grid storage and local backup stations that could be used to keep the lights on during a wider power outage; and communication with devices in people’s homes and businesses to preferentially use energy at times of lower demand, to even out the overall load. It was very encouraging to see that the people in charge of our infrastructure are embracing the coming challenges and opportunities of our changing energy future, and not staying stuck in the past! We would like to thank both of our guest speakers for their fascinating talks, and also Anthony Day for once again being our compère for the evening. There is no doubt that the coming 12 months will be challenging for community energy as a whole, especially given the impending feed-in tariff cuts, but given the increasingly positive public attitude towards renewable and community energy, we remain optimistic and look forward to finding new ways to contribute to York’s clean energy future.